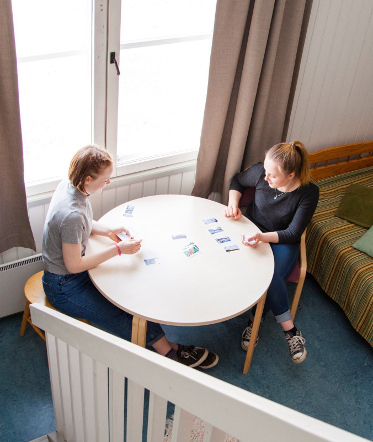 It is possible to spend the night at the Törmälä Holiday and Course Centre with groups of all sizes. 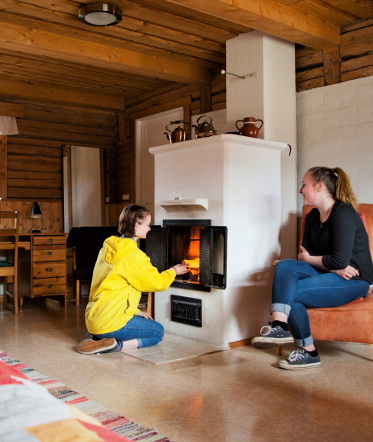 This makes Törmälä an ideal place to stay for individual travellers but also for groups such as confirmation campers. Booking accommodation can be done easily over the phone or by email. Your room is available to you at noon on the day of your arrival until 2 pm on the day of departure. The Suutarinmökki cottage is the oldest building in Törmälä. Earlier it was used as the vicarage’s chicken coop, but has since been restored and this small and cosy cottage in Törmälä can now be lived in. It is equipped with a fire place, toilet facilities, a shower and a small kitchen with tableware. The cottage accommodates two people. The Marjatan pirtti cabin has been built to replace the vicarage’s main building that once burned down. Marjatan pirtti accommodates 52 people at most. 14 rooms (two rooms for 2 people and twelve rooms for 4 people), all of which have a shower and toilet facilities. Rooms are spacious and beds are at floor level. The cabin also includes a drawing room suitable for approximately 20 people. It is applicable for evening events as well as smaller lectures. The drawing room presents a spectacular view of the Hankavesi Lake. Aamurusko and Myllyrinne are located in a separate building some 200 meters from the main yard. Earlier, the building functioned as a school for the intellectually disabled tenants from Vaaliala. The rooms are peaceful and excellent in their quality. All rooms are similar in size, 3 rooms + kitchen, and they include beds for six people. Downstairs there’s a common sauna. Both rooms are equipped with a TV and wireless network. The price also includes a boat and separate permits from the local fishery up to 10 lures. 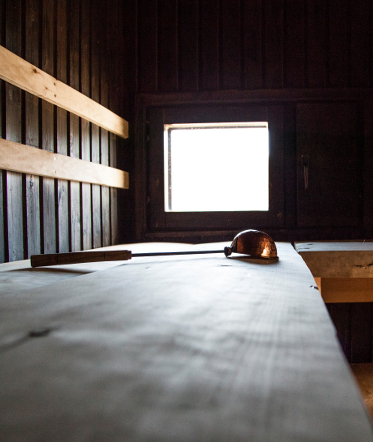 In Törmälä’s idyllic, wood-heated lakeside sauna there are two spacious sauna rooms. The men’s section fits around 20 people and the women's section around 10 people. You can thus go to sauna with even a larger group. The building also has a room with a fireplace. Taking a break from the heat, you can enjoy a cool breeze on the deck or go swimming in the pure and fresh Hankavesi Lake from the nearby dock. During winter it’s possible to take a dip in a hole in the frozen lake.